I experimented and tried pot 4x in my teens. It may have been fun at the time, but I got flashbacks that came unexpectedly. It didn’t happen to those I smoked with; experienced tokers told me the flashbacks were only a part of harder drugs. I was blindsided. Now I’ve read enough to know pot stays in the body much longer than alcohol and that flashbacks from pot are real. Some people said the marijuana that gave me flashbacks was spiked with something else. They were wrong. I’m glad that very bad early experience with pot prevented me from trying any other drugs. It scared me enough not to continue. 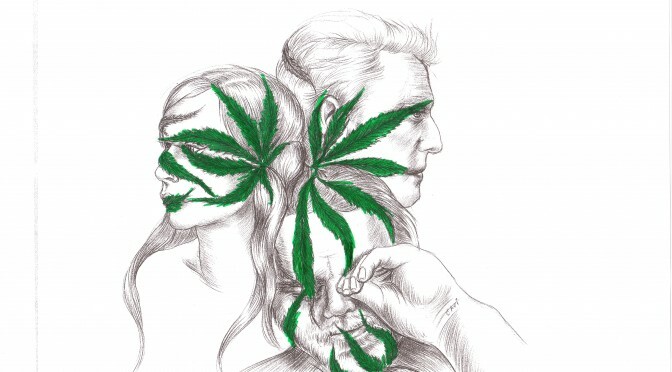 Flashing forward to the next generation — my daughter was picked up in high school at a Target with kids who had pot on them, but she didn’t have pot on her. She was very stoic while the others were acting silly. Was it an act? It’s hard to know. The police just went to the parents’ homes and talked to them. There weren’t any arrests, just a slap on the wrist. In college, this daughter came home her junior year at winter break in a deep depression, what used to be called a “nervous breakdown.” Emergency treatment, testing, counseling and good therapy set her back on the right track. Only later did she tell me that she had been smoking tons of pot and it had made her depressed. She blamed it on “bad weed,” but now acknowledges that weed is really bad for her. Marijuana holds so many false promises. Some of you who read this will say she probably had an underlying bipolar condition. That’s never been suggested by the professionals, but it had been diagnosed for a friend’s niece who ended up in a psychiatric hospital at age 19. Two or three years later, the friend said she is not bipolar, but she had taken LSD. I am sorry for these kids and their parents who go through trauma, anguish and hospitalization simply because they experimented too much with drugs and had not been warned properly. In college, she became addicted to amphetamines. Students who take ADHD medications freely share it and sell it to others. Before college she gave me a scare by having gotten into some of my pills after I had surgery. Doctors were over-prescribing at that time and they should have taken particular precaution in homes where there are teens. It all clicked when I recently read the Yale University study that showed marijuana is a gateway drug for females ages 18-25 who become opiate abusers. As for the gateway theory, some deny it. It makes sense that, once someone takes the initial risk with pot, their brains are primed for more risk. So we’re 3 different people from the same family, and we had 3 different types of bad responses to marijuana. As a teen I was impressed while hearing someone from Alcoholics Anonymous speak to our group. Drugs were big the 70s, but he said alcohol was more acceptable and society should be more concerned about kids using alcohol than drugs for that reason. He was right at the time, but that statement is no longer true. The marijuana lobbyists and pill pushers are trying to make everything else as mainstream as alcohol. My brother’s college roommate was less lucky. He was a championship swimmer at an Ivy League school. Like so many people who were straight in high school, he let loose in college, only to find that marijuana really got a grip on him. He became very addicted to marijuana, but didn’t do other drugs. Eventually he dropped off the swim team and flunked out of school. In those days parents were told to practice tough love and zero tolerance with drugs. They did not pay for him to continue to indulge and he worked as a janitor for the school, to keep close to his friends. He slipped into a deep depression and killed himself. To this day my brother lives with the fact that he didn’t stop him, because he didn’t know it would end that way. Tough love is not a good policy. If you’re a parent, it is better to let those addicted know that you will do anything to save them. Again and again I hear that the children who end up in treatment for multiple drugs always began with pot. I can’t see why we need more tragedies to learn the scope of the damage marijuana can cause. Don’t be blindsided. A 15-year-old from Florida sent this video in response to Amendment 2, the state’s medical marijuana ballot to be voted on in November. We congratulate him and thank him for his creativity. As stated previously, medical marijuana programs implemented by ballot tend to be open-ended and lack protections from secondary sales to children.